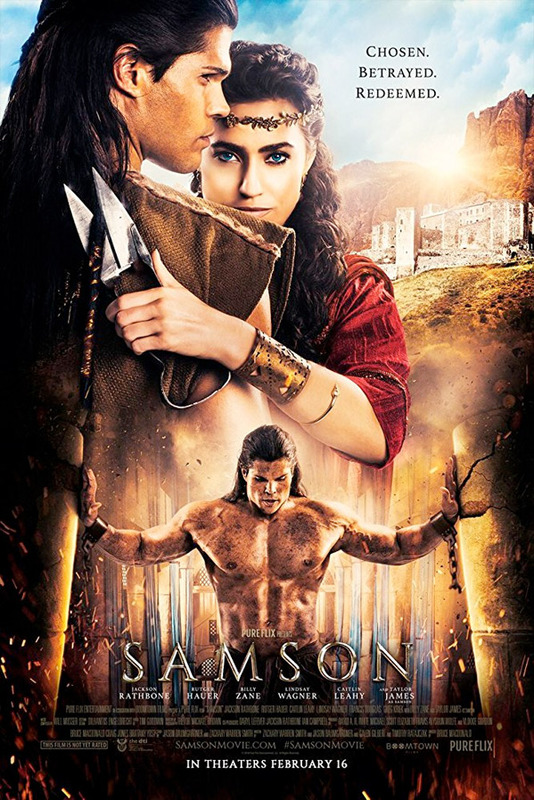 "Remember the prophecy…" PureFlix has unveiled a trailer for the new religious propaganda movie called Samson, an epic cinematic version of the Samson and Delilah story from the bible. Normally we wouldn't post trailers for these kinds of religious films, but I'm making an exception for this because it has such a wildly fun cast - Billy Zane as King Balek, Jackson Rathbone as Rallah, plus Rutger Hauer & Lindsay Wagner as Samson's father & mother, Manoah and Zealphonis. The movie stars newcomer Taylor James as the Hebrew hero, with Caitlin Leahy as Delilah. This movie looks crazy epic with huge VFX and big sets, even though it was independently financed. The story follows a young Hebrew with supernatural strength who defends his people, sacrificing everything to avenge his love, his people, and his God. Yeah, sounds fun. A Hebrew with an unusual gift of strength must respond properly to the call of God on his life in order to lead his people out of enslavement. After his youthful ambition leads to a tragic marriage, his acts of revenge thrust him into direct conflict with the Philistine army. As his brother mounts a tribal rebellion, only Samson's relationship with a Philistine seductress and his final surrender - both to the Philistines and to God - turns imprisonment and blindness into final victory. Samson is directed by Bruce Macdonald (The Last Wave), and co-directed by Gabriel Sabloff (Revelation Road). The screenplay is co-written by Jason Baumgardner, Galen Gilbert, Timothy Ratajczak, Zach Smith. PureFlix will release Macdonald & Sabloff's Samson in theaters everywhere starting on February 16th, 2018 this winter. Anyone interested?